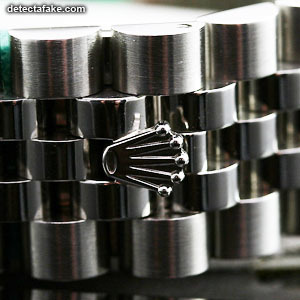 Rolex was a company founded in 1905 by Hans Wilsdorf and Alfred Davis in London, England. Wilsdorf and Davis was the company's original name. 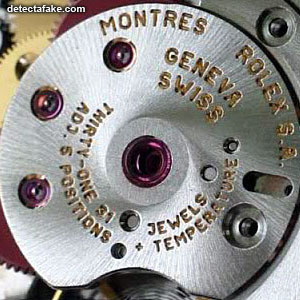 In 1908, Wilsdorf registered the trademark "Rolex" and opened an office in La Chaux-de-Fonds, Switzerland. 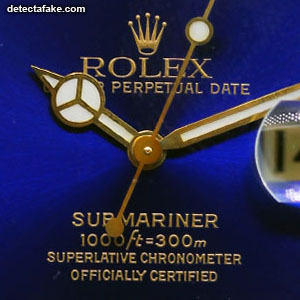 In recent years, the market has been flooded with replica Rolex watches which look very close to the real ones but worth only a fraction of the value and are far inferior in quality. 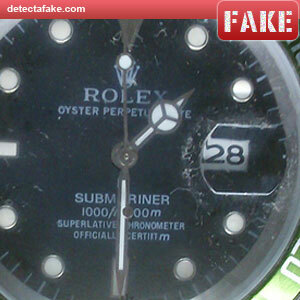 Follow the steps below to see if your watch is authentic. First of all, check the box and certificate of authenticity, everything should be spelled correctly and all printing should be perfect in quality and alignment. 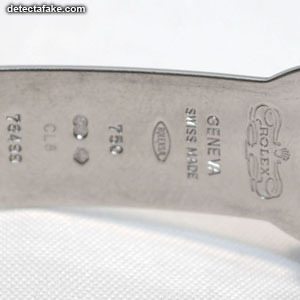 Next, use a jeweler's loupe or a magnifying glass and look at all the letters and numbers on the face. They should all have crisp and clear printing, with sharp corners and no alignment problems. 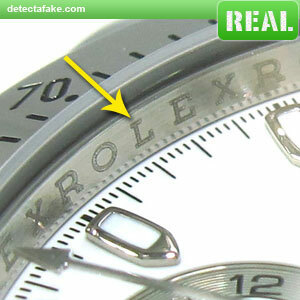 If you see any kind of bleeding on the letters or if the letters are fuzzy on the outside, you probably have a fake. 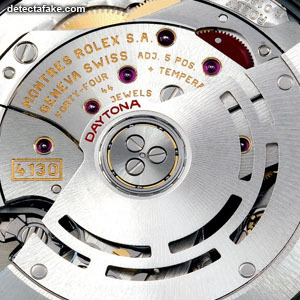 Next, if you have a "Daytona", look at the numbers on the chronograph. The fake has 20, 30 & 40. 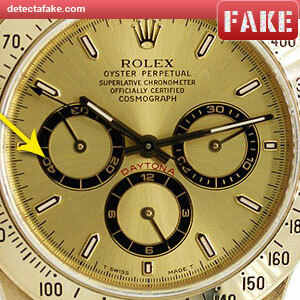 A real Rolex never uses those numbers on the chronograph. Next, look at the crown. 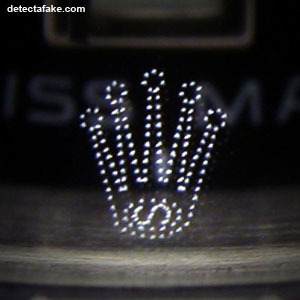 The ball points on a real Rolex should be spherical and have a 3D effect. 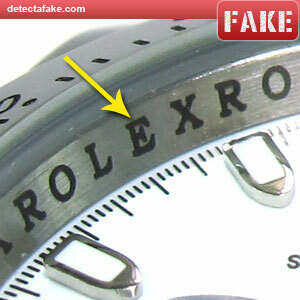 Next, look at the inscribed word "Rolex" going around the inner rim of the dial. As you can see, the fake one is printed in ink and the real one is engraved with a high resolution laser. 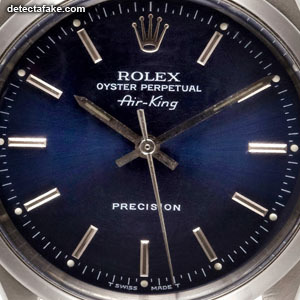 Next, you need to check for the engraved crown that real Rolex watches always have. You will need a jeweler's loupe (x10) magnifying glass. 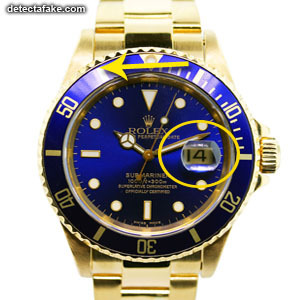 Hold the watch so a bright light is reflecting sideways against the crystal. With magnification, you should be able to see the etched crown at the bottom of the crystal. 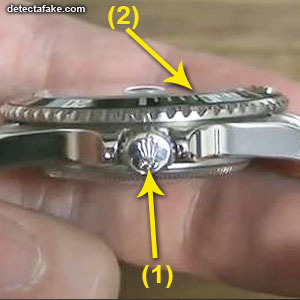 This crown should not be visible when looking at the watch straight on without magnification. Next, make sure the lug has the crown on it, and that when it's tightened down all the way, it's vertical (1). Also in arrow (2), there should be a slight greenish tint visible along the surface of the crystal. 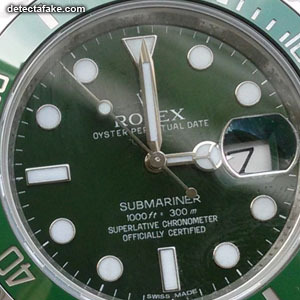 This is because Rolex makes their crystals from sapphire. 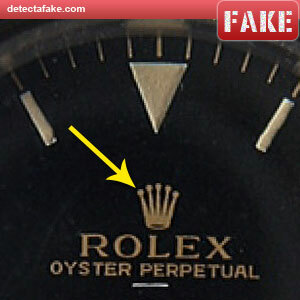 Counterfeit Rolex watches usually are made of mineral crystal which gives off a violet or purplish tint. Next, take a look at the day display, if it has one. When looking straight on, it should take up almost all of the cyclops lens (magnification window). 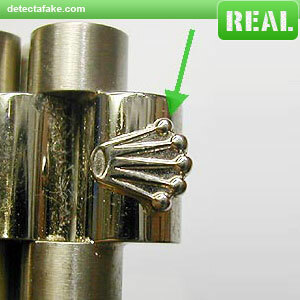 Rolex uses 2.5x magnification while a lot of fakes only have 1.5x or less. As you can see on the fake, it only takes up about half of the window. 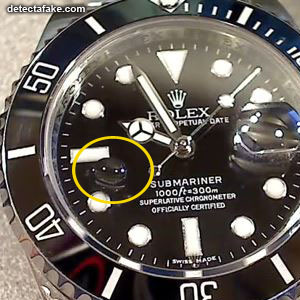 Another thing to be aware of is the bezel. 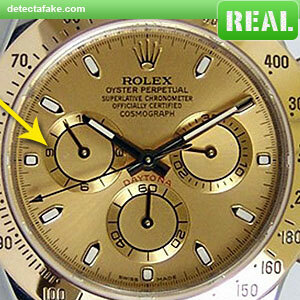 Real Rolex watches only move counter clockwise. 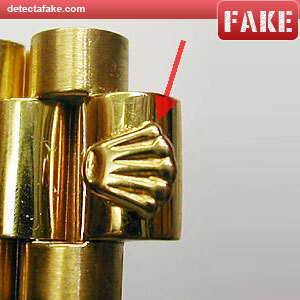 If it move in both directions, it's fake. Next, look at the motion as the second hand moves. It should not move in one second steps. It should move in a motion of 8 steps per second which makes it look like it is moving in a continuous motion. 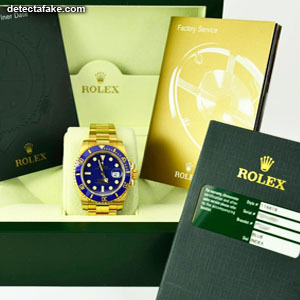 Next, make sure the clasp has the Rolex crown. 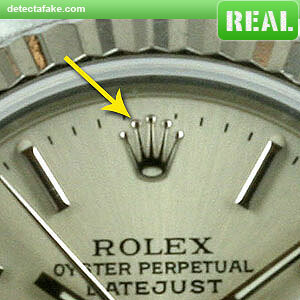 Here's an example of a fake crown. Notice the ball points are not round and they are not distinct from the stems. 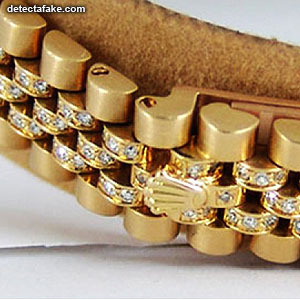 Next, look on the inside of the clasp. There should be a stamp that looks similar to the picture above. 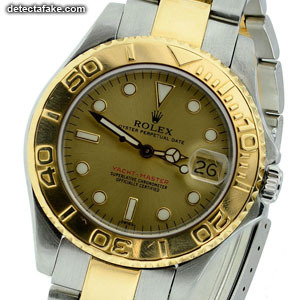 Make sure all the stamps are clean and crisp and that it is either stamped "750" or "18KT". 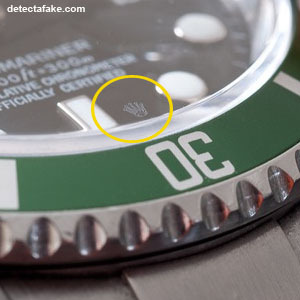 Next, if you're buying from a business, ask the dealer to remove the back so you can see the movement stamp. 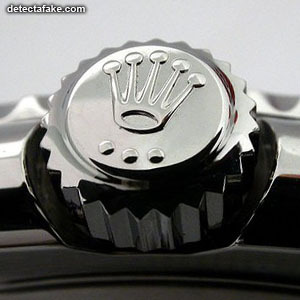 A real Rolex will be stamped with their name on the inside like the pictures above. If the dealer will not remove it, they have something to hide. All dealers can and should do this for a potential customer, so don't buy it if they don't. Another test to do is check the water surface tension on the crystal. A smeared film of water will almost always pull together on crystals made from sapphire because the surface is smooth. In the picture above, a drop of water was set on the crystal and as you can see, it did not spread out.